Marketing Professional. Serial Side Hustler. ... and what you should do instead. "Linktree is a free tool for optimising your Instagram traffic, whether you're a blogger, an artist or run a content platform. You'll get one bio link to house all the content you're driving followers to. Let your content live longer than the feed." All of that FOR FREE. Sounds great, right? Well, believe it or not, there's a couple drawbacks from their free version. 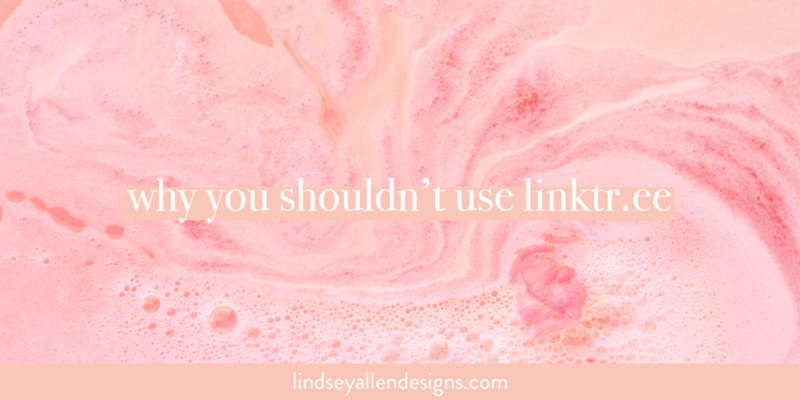 In this post, I’m covering Linktr.ee, all that it does (and doesn't do) for you and your brand, why you shouldn't use it, and what to do instead. So, grab your notebook and your coffee cup -- you're in for a solid post with some great action steps. What is Linktr.ee and why might I use it? Like I said, super simple, super clean. It allows you to create buttons that link up to several different things. As you can see, I have mine linked to my about page, recent clients projects, newsletter list, graphic tee shop, and a popular blog post. Now, before you run off and get yourself a Linktr.ee, let me bring a few things to your attention first. There's a couple branding dilemmas with Linktr.ee. The first dilemma? The backgrounds. Although they provide a handful of background options, you're likely still compromising on your visual branding in order to use their service. The second dilemma? Their name, Linktr.ee, is all over their free version. It's in the URL on your Instagram bio, at the top of the landing page (see above), and at the bottom of the landing page in logo form. Can you see how that might be confusing to someone that isn't immersed in the Instagram world?? This tool comes at two different price points, free and premium (costing $6/month). Now, because you're a savvy business owner, you're looking to save in every place possible. Plus, why would you pay for something when you could do it yourself for free?? Make your own mobile optimized landing page! This truly is SUCH a simple solution even for someone that identifies as a technophobe. I got you. From a time perspective (because time is money), this simple solution might take you an extra 10-15 minutes. I promise you the time investment will be worth it. Now, since I'm a Squarespace guru, not a WordPress, Weebly, Wix, or Blogger guru, these instructions will be for Squarespace -- although I would bet that the method could be adapted for other website platforms. Select the + to the right up "Not Linked"
Once your image is uploaded, select "Design"
From the dropdown menu on "Image Link", select "Button"
Then, click on the collage box that is overlaid on your image to type in a title and subtitle. You'll see above that my image box is peach and I only typed in a title. Create as many or as little of these buttons as you would like! Here's a few screenshots showing you what I've included on mine. If you have 5 minutes to spare, I highly, highly recommend creating a brief about section at the bottom of your new page. If a new follower is using this link for the first time, it's an awesome way to build rapport with them. Insert a cute picture of your pretty face and paste a few lines from your about page. Easy peasy! If you have made it down to the bottom of this post, BRAVO! I'm giving you a virtual standing ovation. If you need any help with what I've outlined above, please let me know! I'm more than happy to help. Are you implementing this free trick? Leave your super cool, custom link in the comments below so I can check out your linktr.ee substitute! So, is it actually time to rebrand? I’m a marketing strategist and web designer that teaches all of my insider tips and tricks to passionate small business owners. Powered by Squarespace. Designed by Yours Truly 🙋‍♀️.